Intrepid Japanese detective Maiku Hama is on the case in this adventure, the first of a three-part comedy series. Hama is a total klutz, and his attempts at machismo fall flat. When he is on a case, Hama spends more time getting beaten up than he does solving it. ... a lively, witty tribute to American private eye films with a serious core. A 1990's Japanese detective film lovingly and respectfully shot in black and white in the style of a 1950's American detective film, complete with fallable PI , twists and turns and a bitter-sweet denouement. Fun. Starring Masatoshi Nagase of Mystery Train / Cold Fever / Suicide Club etc etc fame. I saw the write up on this in Shock Cinema Magazine (Issue 6) If I remember right. So when it arrived by mail I put it on the shelf saying when I get to it, little did I know that it was a Kino Video Release. And little did I know that it was a 5 star great film, 6 stars if I could. 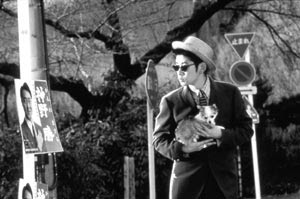 Its a Japanese film shot in Black & White (Shot in 1993) to give it that film noir look. Its suppose to be a spoof n the American Crime films of 1950-19660 time frame, and after all with a detective named Maiku Hama, how could it not be nothing but funny and interesting at the same time. Its not really a comedy and Director Kazio Hayashi has done a excellent job with this one. This is the first of a trilogy the other two being Stairway to a distant past and the Trap, which I will now order and review as soon as possible. This is a good film, not only for the comedy part but also for overall story. One other thing it has English Subtitles. Enjoy, and if you haven't seen a Kino Video yet you need to try them out and get there catalog, use a search engine just type Kino Video for some excellent world films. Some scenes might suggest a possible inspiration by Quentin Tarantino, though this 1993 film (released in the U.S. in 2000) predates Pulp Fiction. Shot in glorious black-and-white, faces linger in shadow, and the flicker of the silver screen invades Mike's office, and with a hard-boiled narration provided by our hero, this is a timeless comedy punk noir that could be taking place anytime from the 1950s onward. Mike's classic mini-convertible and the groovy 70s score only add to the displacement. But "Terrible" is serious fun, a B movie with an agenda. Altogether, the film is beautifully violent and the imagery is striking and haunting. The complexities of the characters are brought to life by wonderful performances from the supporting cast. The film paints a vivid picture of the underbelly of Hong Kong and highlights strongly upon the racism that rests between Chinese, Taiwanese, and Japanese people. Ultimately, The Most Terrible Time in My Life is a great story of brotherhood betrayals, the stark underworld of Hong Kong gangland, and how harmless motivations can become the most dangerous ones.